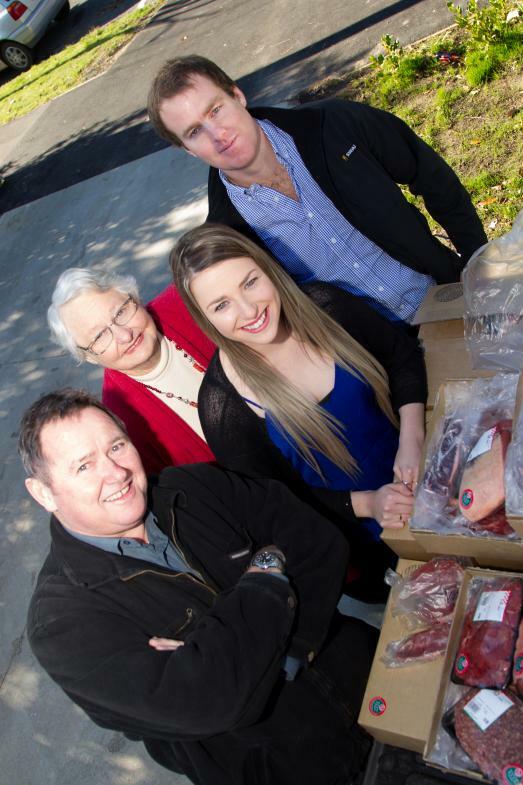 Mike van der Hoeven, left, from Magills Meats in Te Awamutu, Hereford Prime director Jan Wills and Sam Rainey, right, area sales manager from Tru-Test with Kayla Conwell-Grant winner of Tru-Test’s Win Your Weight in Hereford Prime Beef competition. Rotorua girl, Kayla Conwell-Grant has filled her fridge with award winning Hereford Prime beef and small goods after edging out much heavier entries to take out the Tru-Test ‘Win Your Weight in Hereford Prime Beef’ competition held at this year’s National Fieldays at Mystery Creek. The 19 year old has been a regular visitor to the National Fieldays event attending with her family who have farmed in and around Kaharoa in the Bay of Plenty for many years. The competition, launching Tru-Test’s new 5000 series weigh scales, attracted thousands of participants willing to declare their weight for a prize of equivalent amount in small goods and premium cuts of mouth-watering Hereford Prime Beef. A friend, excited by the competition and determined for his successful entry, brought Kayla to the Tru-Test site for the very purpose of jumping on the 5000 series weigh scales but it was Kayla who took out the prize coming in just shy of 60 kilograms. In her first year flatting in Hamilton while studying towards a Bachelor in Sport and Leisure at Waikato University, she says the win is being welcomed by the flat as they prepare for the second semester of study. Hereford Prime brand manager Natalie Campbell said she was thrilled for Kayla in her tasty win and was delighted the Tru-Test launch of their new 5000 series weigh scales was so popular. “Partnering with Tru-Test in the launch of the new scales also allowed us to expose our own brand to the large number of visitors to fieldays – and it was a great opportunity to show our support to Tru-Test,” said Natalie. Verne Atmore, Tru-Test’s New Zealand Sales and Marketing Manager says the company has a long history of working with NZ Herefords. Magill Meats from Te Awamutu supplied the Hereford Prime steak cuts and small goods and Mike van der Hoeven was on hand to present Kayla with her prize along with Hereford Prime director Jan Wills. Later that evening the flat-mates could not resist testing the steak. “It was just absolutely delicious,” said Kayla.